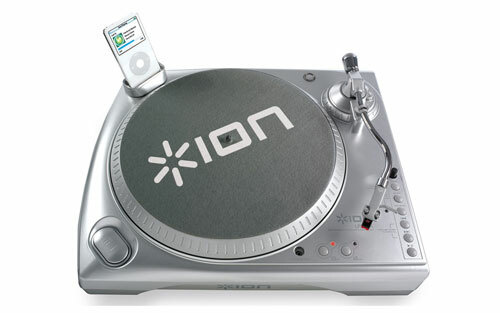 Check out the LP Dock from ION Audio, now you can easily convert your LP collection direct to your iPod. LP DOCK includes EZ Vinyl Converter 2 for PC (EZVC2) and EZ Audio Converter for Mac (EZAC); the best way to record and convert vinyl directly to iTunes. EZVC2 features Gracenote® MusicID technology, which analyzes your vinyl and automatically retrieves album, artist and song information for you! EZAC lets you easily enter track information. You can now digitally archive your collection in just a few mouse clicks. It comes with a USB port so you can connect it to your PC and also line out if you want to hook it up to your stereo. It is available to buy online for $259.99 from Hammacher.